Our electronic signature feature is accessed through our SecureDocs Virtual Data Room or SecureDocs Plus products. Like the rest of our software it is simple in it’s design and very easy to use. To use, you simply click the pen icon next to the document that you need signed in your data room. Then to request a signature, identify the recipient using their name and email, customize your signature instructions from the data room, and send to as many parties as you need to. Each signer will have a unique identifier, and you have a complete real-time record of all interactions with that user moving forward. During the signature process SecureDocs sends automatic reminders for all unsigned requests three and seven days after the initial request was made. You also have the ability to cancel your request with a click of your mouse. Once the signature process is finished the signed document will remain in your data room along with a complete record of all actions taken through the audit log. Would you like to see SecureDocs live? 1. You don’t currently have electronic signature abilities. If your organization still relies on a pen and paper signature process SecureDocs with electronic signature allows you to streamline your signature and corporate document storage processes. 2. You have transaction documents that need signatures. During the deal process you will need to request signatures on NDAs, letters of engagement, and other corporate agreements between the parties involved. 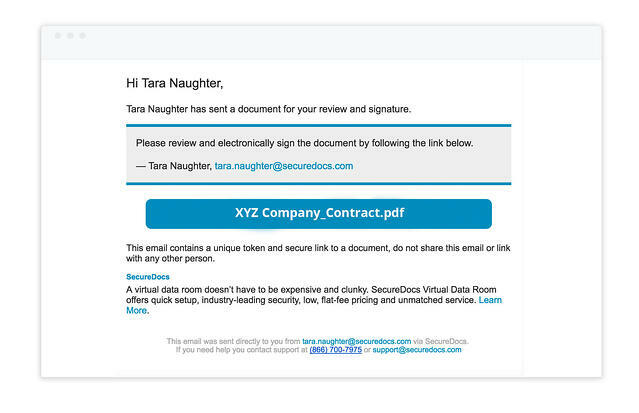 With SecureDocs you can request these signatures directly from your secure data room, and gain complete transparency into user actions through the detailed audit log. 3. You use your data room for ongoing corporate document storage. Businesses like yours are choosing to store their most critical corporate documentation online. Much of that documentation contains personal or private information unique to employees, vendors, clients, and to your company. SecureDocs with electronic signature allows you to sign, store, and manage all corporate contracts from one secure location - eliminating the need for outside systems that could leave your information vulnerable to theft. 4. You want to simplify your document management processes. Managing your corporate information using multiple systems is time consuming, and can lead to a disorganized workplace. Consolidating corporate systems as much as possible saves you time, and results in a more secure and efficient business environment. SecureDocs now solves the problem of securing and tracking important information as well as executing the business agreements necessary to move your organization forward from one central location. 5. You need complete transparency into all of your corporate documentation. For businesses who frequently share and license intellectual property and other proprietary data it is tremendously important to maintain a detailed account of all interactions with critical company data. This includes having clearly documented proof when outside parties sign NDAs or other security agreements in order to protect and ensure success of their organization. SecureDocs built-in electronic signature was designed to comply with the ESIGN Act as well as comply with individual state regulations, and can give you peace of mind when sharing your information with authorized users. How do you get electronic signature? Getting SecureDocs with built-in electronic signature is easy. Begining March 1st, 2017 all new SecureDocs Virtual Data Room and SecureDocs Plus accounts come standard with electronic signature capabilities. Please get in touch with us today to see a guided demo of our product or submit a free-trial today to gain instant access to your full feature SecureDocs Data Room.